DETROIT, May 16, 2017 /PRNewswire/ -- DTE Energy today announced a broad sustainability initiative that will reduce the company's carbon emissions by more than 80 percent by 2050. This reduction and 2050 timeframe align with the target scientists broadly have identified as necessary to help address climate change. "Over the past two years we have studied the engineering and economics of Michigan's energy future very, very carefully," said Gerry Anderson, DTE Chairman and CEO. "We have concluded that not only is the 80 percent reduction goal achievable – it is achievable in a way that keeps Michigan's power affordable and reliable. There doesn't have to be a choice between the health of our environment or the health of our economy; we can achieve both." DTE's efforts to cut its carbon emissions will garner a 30 percent reduction by the early 2020s, 45 percent by 2030, 75 percent by 2040 and more than 80 percent by 2050. The company will achieve these reductions by incorporating substantially more renewable energy, transitioning its 24/7 power sources from coal to natural gas, continuing to operate its zero-emission Fermi 2 power plant, and strengthening options for customers to save energy and reduce bills. These plans define a long-term shift by DTE to produce over three-quarters of its power from renewable energy and highly efficient natural gas-fired power plants. "I want to be clear that this plan is more than a commitment to a long-term goal in 2050," Anderson said. "We have already begun fundamental transformation in the way we produce power, and we will press that transformation forward steadily in the years and decades ahead, sharply improving environmental outcomes in the process." "We need to lead by example by reducing water and energy use at DTE as we work with customers to do the same," Anderson said. Previously, DTE retired three of its coal-fired power plants – the Marysville, Harbor Beach and Conners Creek plants. In 2016, three additional coal-fired generating units at plants also were removed from service. This process of retiring coal-fired power capacity will continue with the retirement of the River Rouge, Trenton Channel and St. Clair power plants in the early 2020s. Since 2009, DTE has spearheaded more than $2 billion of investment in wind and solar resources. 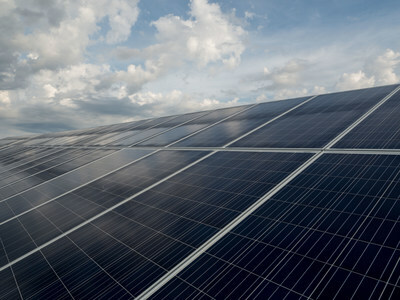 The solar project DTE recently completed in Lapeer, Mich., is among the largest solar fields east of the Mississippi River. "The transformation of the way we produce power is in full swing," said Anderson. "Like all big transformations, this one won't happen overnight. It needs to be planned carefully and will entail big investments, but that can absolutely be done. We are committed to accomplishing this within the timeframe scientists have laid out, and in a way that works for Michigan's economy, homeowners and businesses." Since 2009, DTE has spearheaded more than $2 billion of investment in wind and solar resources.